A trip to New Orleans usually means partying in the French Quarter and Mardi Gras – but for brokers attending MCAP’s Habitat for Humanity summit this week, it was about paying it forward. 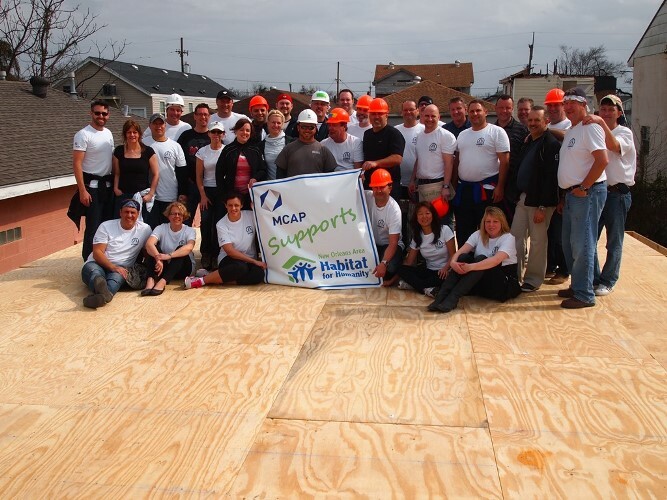 MCAP has made Habitat for Humanity its charity of choice for a number of years, and holding their summit in New Orleans provided the ideal opportunity for everyone to work together, no matter what brokerage everyone was affiliated with. MCAP’s 40 top-producing brokers from across Canada spent the second day of their well-earned five-day New Orleans broker trip in hard hats and work gloves. Under the tutelage of Habitat’s building specialists, the team devoted eight hours working tape measures, levels, saws, hammers and nails like pros as they laid floors and erected walls at the residential building site located in the Central City area of New Orleans. “I was hammering nails,” laughs Cameron, who admits that he may have spent more time un-hammering his mistakes. “The funniest part is when I had to crawl underneath the floor and hammer back the nails I had put in that were wrong,” he remembers, although takes pride in helping those who still are mired in the devastation from the flooding caused by the 2005 hurricane. MCAP has been an avid supporter of Habitat for Humanity for over a decade, organizing employee and partner volunteer efforts to help the non-profit organization put low-income families into homes. The company also has the Key to Hope program that allows mortgage clients to make tax-deductible donations to the cause through their mortgage payments. Habitat for Humanity is a worthy organization, doing great work everywhere.